CSU President Heather Lucas warned that the lawsuit would last at least two years and would cost the student union a minimum of $220,000. “We are getting out of a non-democratic organization that doesn’t represent us, and when we are paying $300,000 a year for something that doesn’t give us anything in return, we should use that money to get out of the Federation,” said Lucas. Last March, 72 per cent of Concordia students cast a ballot to leave the CFS, a national student lobby group. The vote came after a referendum requiring thousands of signatures and years of disintegrating relations between the student union and the CFS. The national lobby group is said to have spent tens of thousands of dollars fixing student elections at Concordia while squandering millions on legal wars and underperforming services. The CSU’s departure last year was part of a wave of 13 student bodies attempting to leave the CFS, none of whom have done so successfully. While the CSU Council directed the student union’s executive to use legal means to leave the national lobby group in August, Tessier explained that the lag was necessary. “Going to court is not a fun thing, it is not a cheap thing and it is not in the nature of a student union to sue another student union, especially to have the other student union recognize something as simple as the right to vote in a referendum,” said Tessier. In the case of Concordia’s referendum, which the CFS never recognized, the national lobby group claimed that the student union owed it $1,033,278.76 in unpaid fees, a claim refuted by Concordia University. “The pattern is clear. The CFS recognize those referendums which state, ‘We want to stay with the CFS,’ but do not recognize those which state that they want out,” said Tessier. A referendum held at the Alberta College of Art and Design was recognized by the CFS after students voted to stay in the Federation. The CSU is seeking five resolutions from the Quebec court. 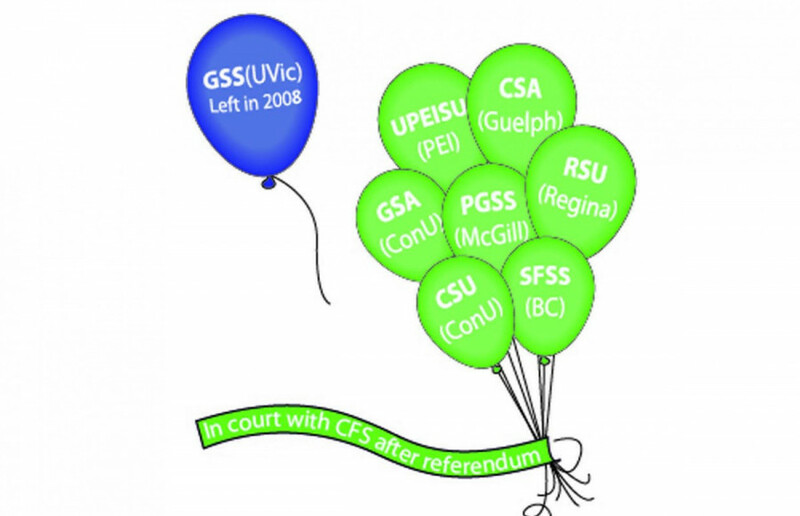 The student union wants a bylaw change at the CFS in November 2009, which increased the quorum necessary to leave the Federation from 10 to 20 per cent, rejected. The CSU is also seeking that the courts reject the national lobby $1 million claim against the student union and recognize the referendum where Concordia students voted to leave the CFS. “Lastly, we want the courts to condemn the CFS to pay two plaintiffs in the way of punitive damages pursuant to section 349 of the Quebec Charter of Rights and Freedoms to the sum of $100,000 because of their violation of the right under article three which provides the freedom to associate,” said Tessier. CSU VP Loyola & Advocacy Hassan Abdullahi will serve as one of the plaintiffs under the Charter portion of the lawsuit. To help fund the lawsuit, the CSU has withheld the nearly $300,000 in annual dues it gives the national lobby group and will use the interest to pay legal fees. While the lawsuit will extend past Lucas’ mandate, the fight against the CFS is a subject that all slates running in the CSU’s ongoing election agree with. “Whoever runs the executive next year, I will tell them that they are going to be in a big court case and they should set money aside for it,” said Lucas. Concordia’s Graduate Student Association filed a nearly identical lawsuit at the same time as the CSU. The Link contacted CFS National Chairperson David Molenhuis. However, he could not comment on the CSU lawsuit before press time. Chad Walcott is a game-changer. A current executive on the Arts and Science Federation of Associations, Walcott surprised both peers and the press in going against the implicit expectation to “toe the Action/ASFA party line,” by joining the Your Concordia slate. This shift on campus, Walcott explained, is represented by Your Concordia’s roster of activist election candidates who are largely responsible for the mobilization of students this year, from anti-bottled water advocacy to the organization of the WHALE and the protest against increased university tuition in Quebec City last semester. Explaining that he feels the current union seems out of sync with the needs of the student body—catering to apathy and “those who just want to party”—Walcott said he is confident that Your Concordia represents the response to a need for real changes in Concordia’s hallways, and that his team recognizes that many students are starting to pay attention to the lack of student space, impending tuition increases and our current Board of Governors crisis. Though he is excited about all of Your Concordia’s campaign points, Walcott said he is most excited about their capability to activate students when necessary. “I’m running with a group of people who have a track record of being able to mobilize a lot of students around an issue,” he said. “That’s why I took the external portfolio. I want to talk to the FEUQ, talk to the other universities, and at the same time facilitate discussion between the four faculties in our university so we can have a clear message about what we want as Concordia students moving forward. Walcott said he has also enjoyed going head-to-head with his competition—Action VP External hopeful Georges Alexandar—during classroom speeches along the campaign trail.